Easier Way to Make Green Screen/Chroma Key Videos. Make Green Screen videos with ease. 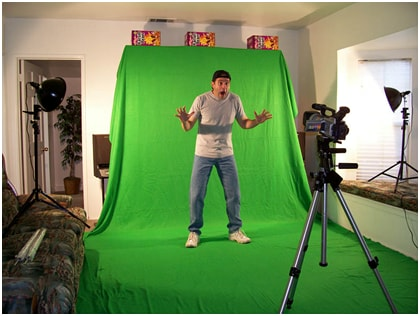 Green screen videos are generally used to create realistic environments and background scenes without having to film on location. When done correctly, your green screen videos are not only safe, but also can bring unique and magic effects to your video projects, without letting anyone notice that you aren't on location. If you are wondering how to compositing the shot green screen video with your main video on your Windows PC or Mac, try Wondershare Filmora. Watch the video tutorial of How to make a green screen video with Filmora. In the following section, we will share with you five tips when you shooting a video for compositing a green screen video, which covering the lighting tips, the camera tips, the clothing tips, the tips for using green screen sheet, and the tips for resolving motion blur in shooting videos. To shoot a nice green screen video, it's better to be able to light the background and the subject separately. It allows you to fully control the intensity and color saturation of the green screen. You are free to light your subject as you wish and avoid any shadows falling on the background. So typically two or more lights are used to light the green screen. Adjust the light positions and filters until you get the satisfying result. If your subject is human, it requires 6-10 feet between your subject and the background. Don’t throw too much light onto the green background. That will create hotspots and “green spill” on the subject and make the key less effective. The key to lighting a green screen is consistency – create a single, consistent shade of color across the entire screen. 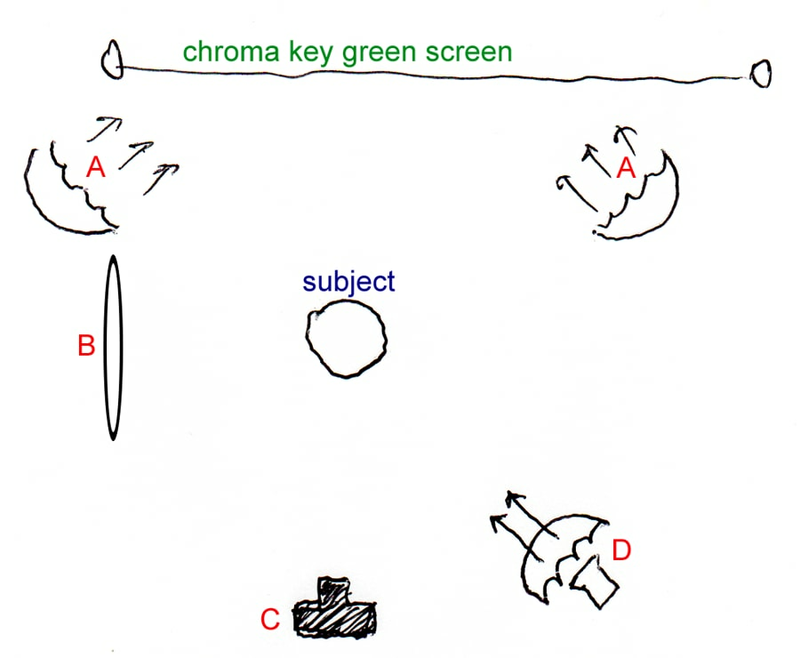 When lighting your key surface, make sure the bounce light is not directed at the camera (as shown in the image above). For example, if your camera faces the key surface directly, set your lights at 45 degree angles to the key surface. This will ensure that the bounce light bounces toward the other light and not at the camera. Also choose carefully the camera as some cameras are better to shoot green screen video, especially if you are shooting something with a bit of movement. Then shoot your video as HD quality video (720p or higher) and save in a format your green screen software can import. When shooting the green screen video, it's of great importance to keep the camera very still and a tripod is necessary for this purpose. The simplest shot is to captures the whole body in the center of the cloth so that none of the peripheral edges of the room can been seen. Another general rule is that it's better to lose legs in a shot than the head of an individual. Although sometimes it's essential to film a perspective that break these rules, many problems can be overcome in the editing process. There are some mistakes that you can avoid to help your green screen video look more professional and more realistic. Perhaps one of the simplest mistakes that many people make with green screen video shooting is actually wearing green clothing. If you are wearing clothing or clothing that has buttons or accents that are a similar color green as your selected background green, the image that you project onto the green screen in post-editing will also get picked up by these accents on your clothing or by the clothing itself. This is great if you want to cut off part of an actor's body, but not so professional if you are trying to make an actor appear in a realistic scene. Wrinkles in your screen can actually lead to heavy shadows and distorted image quality in your green screen video. 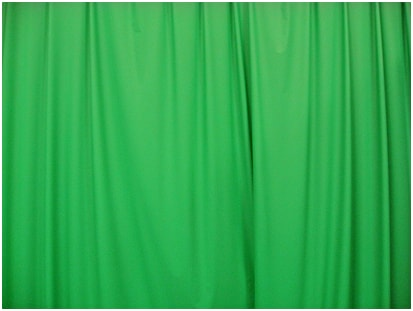 If you regularly fold your green screen for storage it's very important that you take an iron out and flat negative green screen to prevent shadows and distortions with your background image. This is a step that many skip over but it's important to have a high-quality green screen without wrinkles and folds that cause shadows. If you are planning on shooting a high action scene in front of a green screen with a camera that only has lower shutter speeds, you can run into real problems. When using a camera with a lower shutter speed consider doing action shots in slow motion or getting subjects to not make any sudden movements in front of the green screen. Motion blur from someone moving rapidly on camera in front of a green screen can really ruin the scene and ruin the realism of the scene. 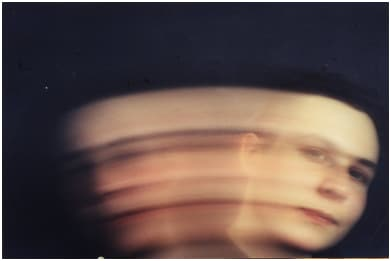 Alternately you could also consider renting a high shutter speed camera to avoid this motion blur if you do plan on shooting a lot of action scenes. Ultimately this is something that you will need to test for yourself before shooting a green screen video, so that you can get a feel for how much action your camera can handle with a green screen without motion blur. Till now, I believe we have basic skills on how to shoot a green screen videos, in technique way. The other important thing, is to have our own green screen ideas. Let’s check out the youtube green screen videos and inspire your own green screen ideas. Besides compositing chroma keying videos in Filmora, you can also stabilize your shaky videos, put videos side by side, blur the face in the video and even more. Check our video tutorial below of how to edit videos in Filmora.